GM Sanan Syugirov and GM Andrey Zontakh give their comments on the tournament in Elista. The tournament is over, let us strike sport, creative and theoretical balance. First and foremost I would like to distinguish the tournament winners. Dmitry Jakovenko will be remembered for his amazing tenacity in the defence and delicate end-game technique. Teimur Radjabov, a bedivere of King’s Indian defence, - confident game with Black. 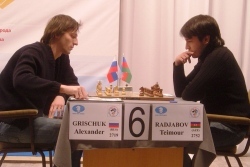 Alexander Grischuk – for his strong-willed character, replying with three wins in a row for the defeat. The last round did not appoint the ultimate winner, as all the leaders drew their games. As the Russian saying goes, ‘friendship wins’! This was a truly titanic struggle! The grandmasters have responsibly fulfilled their duty, but their forces were equal. The theoretical dispute in the King’s Indian ended in Radjabov’s favor. He was first to surprise the opponent (14…Re8!?) and soon seized the initiative. Grischuk showed good sense of danger and began to simplify the game. The resulting ending with opposite-colored bishops looked objectively drawn, but Teimour played very energetically and created certain pressure. Alexander had to demonstrate good defensive technique to hold a draw. Live Commentary of one of today's games by GM Sergei Shipov is available here. Commentaries from the previous rounds can be found in Games Commentary section.